BEAUTIFUL SOUTHWEST GUARD GATED COMMUNITY HOA ONLY $177 A MONTH! THIS HOME HAS IT ALL! PRIVATE TROPICAL BACK YARD, POOL/SPA, COVERED PATIO, BBQ, FIRE PIT, WATER FALL. KITCHEN, W WALK IN PANTRY, ISLAND, GARDEN WINDOW, GRANITE COUNTERS. MB HAS DUAL FIREPLACE BED/BATH, WALK IN CLOSET. SECONDARY BEDS GOOD SIZES. LOTS OF NATURAL LIGHT! HOME HAS BEEN IMMACULATELY CARED FOR. 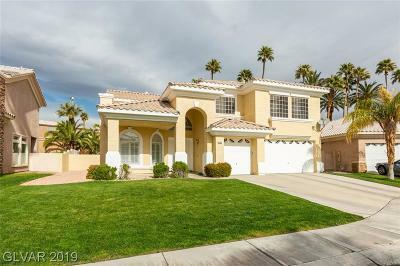 FABULOUS SW LOCATION CLOSE TO DOWNTOWN SUMMERLIN, 215, SCHOOLS, SHOPPING!! Directions: 215/Tropicana. E On Tropicana, L On El Capitan. Guard Gated Community Of Granada Hills On The Right. Through Gate, R, Then First R To Property.